(Seychelles News Agency) - A project in Seychelles is creating freshwater reserves using an approach that emphasises a natural approach to advanced engineering. 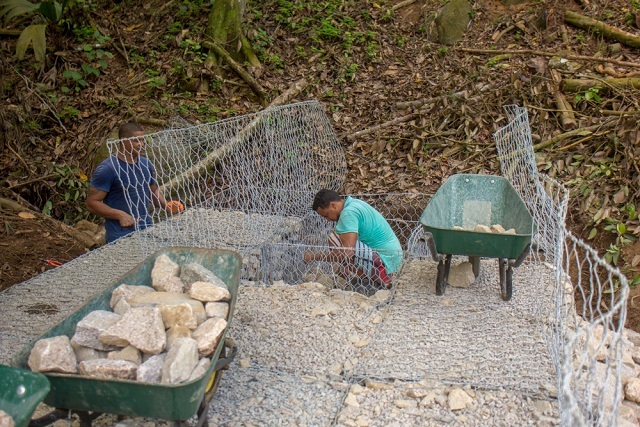 The ecosystem-based adaptation to climate change in Seychelles (EBA) project has successfully constructed a first-ever gabion rock barrage at the Bougainville wetland in the district of Takamaka in the south of the main island of Mahe. The 40-metre-long barrage now holds about 35 million litres of water. In engineering terms, a barrage is an artificial obstruction in a watercourse to increase the depth of the water. Mendez added that the approach presents an alternative to desalination for potable water production and the sustainability of our environment. “In rivers, gabion rock weirs act as filters and allow the creation of wetland ecosystem when they are combined with plant engineering. As its first function is to retain water, it is the cornerstone of man-made wetland ecosystem, entire ecosystems, that functions in and around the water,” explained Mendez. The EBA project has identified seven different locations on Mahe to build the gabion barrages. The project is having the on-site training to build local capacity in constructing gabion rock barrage as an ecosystem-based approach to water storage in Seychelles – a group of 115 islands in the western Indian Ocean. Two separate training was held one for contractors, farmers and other interested individuals. The second which kicked off last week at Val d’en dor in Baie Lazare is for students following a diploma in construction course at the Seychelles Institute for Technology. The students are getting the training as well as starting to construct a new barrage of approximately 60 meters long. The practical course is on gabion mounting and assembling resulting in a new filtering dam which will benefit the farming community in the area. “We have identified this area as it has a water source, in addition, its topography is like a basin making it ideal for water storage,” explained Pascal Octave the trainer of the capacity building session. Ben Hermitte - a contractor who attended the first training - is also assisting with the second session as he wanted to deepen his knowledge on this approach which he says is fascinating. “This is a very good approach for the environment. I have seen the completed one and I am now giving my time on a voluntary basis to build this one and others to come as this will be my contribution to the Seychellois community,” said Hermitte. The second barrage is expected to be completed by the middle of December. The project consultant said the project will then move on to other sites to construct these water reserves. 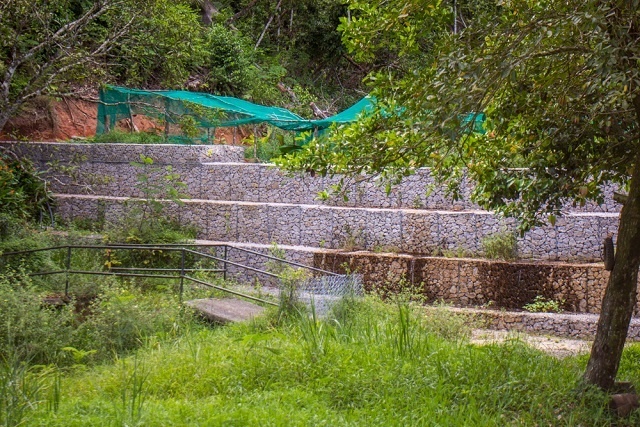 “Compared to a conventional dam, gabion filtering dam are way easier, Seychellois made and cheap to build. Also, the footprint on the island ecosystem is positive as it benefits downstream level protecting the reef from land degradation pollution during heavy rainfall,” said Mendez. The ecosystem-based adaptation to climate change in Seychelles is being funded by the Adaptation Fund, which finances projects and programmes that help vulnerable communities in developing countries adapt to climate change. Initiatives are based on country needs, views, and priorities.